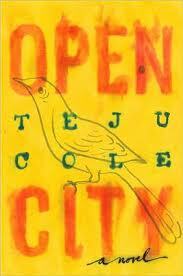 Teju Cole is an amazing author and this is his first full length novel. It’s generally about an almost unnamed 1st person narrator, a single, 30-something year-old immigrant from Nigeria, who works as a psychiatrist in Manhattan. As he walks around the city’s neighborhoods about 5 years after 9/11, he visits parks and museums and we are privy to his thoughts about immigration (we are a nation of immigrants), “brothers” (who is your brother) and history (of art, music and a whole host of other things). He travels to Belgium to see if he can’t locate his old Oma and meets immigrants there as well – some radical, some not so much. The book is just scattered with allusions to artwork, music, literature and other things. It never feels like Cole is showing off but rather that we’re getting into the head of his very intellectual protagonist, Julius. The memories (and that is another main theme) of his own childhood are quite intriguing as are his discussions with his Belgian/Nigerian friend. I was very much unnerved by the revelation toward the end but I believe it did have to be there. Historically, we are all harmed as well as guilty and we all have to live with it.